Celebrating 75 years of Captain America! From his first appearance in 1941 Captain America has become one of, if not the most, influential comic book characters ever to be created. Now in this his 75th Anniversary year we are proud to present this Captain America 75th Anniversary Coin officially licenced by Marvel Comics - available exclusively in the UK through The London Mint Office. A minting milestone - the world’s first shield shaped coin! This coin is struck to a Proof finish and contains a full 2 Troy ounces of pure .999 silver. Just like Captain America’s legendary, vibranium-alloy shield this coin is a marvel of engineering – it measures a massive 50.8mm in diameter, is beautifully coloured and curved. This is the world’s first ever shield shaped coin - it really looks like a miniature version of Captain America’s iconic trusty shield! Officially Issued by Marvel and authorised by the island nation of Fiji each silver coin comes beautifully packaged in a black lacquer display case, a shield replica is embedded into the box lid, and inside the coin is encapsulated in a domed capsule surrounded by white satin. Each coin includes one of MARVEL'S trademark silver Certificates of Authenticity. Each certificate is sequentially numbered from CA75-00001 through to CA75-07500 and is made from 2 grammes of pure .999 silver! Also included with each 75 Years of Captain America Coin is a Cloisonné style lapel pin. Cloisonné pins have a royal history and a legacy of beauty that dates back to the 13th century. In fact, the cloisonné process was first used in ancient China. Each colour is filled separately and fired in an oven at 1700 degrees, creating an accessory for you to show your support for Captain America! To correspond with the 75th anniversary of Captain America just 7,500 of these coins have been issued worldwide. Interest across the world has been phenomenal - not just amongst MARVEL fans, but from coin collectors due to this coin’s unique world-first design. This coin is exclusively available in the UK through the London Mint Office - order today! ★ Authentic MARVEL licensed product. ★ The world’s first two-ounce .999 silver, shield-shaped coin! ★ A spot-on, legal tender replica of Captain America’s legendary, Vibranium-alloy shield. ★ A top-quality, black lacquer display case with cloisonné style Captain America embellishment. ★ A unique, sequentially numbered, Certificate of Authenticity made from 2 grammes of pure .999 silver. ★ Cloisonné style lapel pin looks just like Cap’s shield. 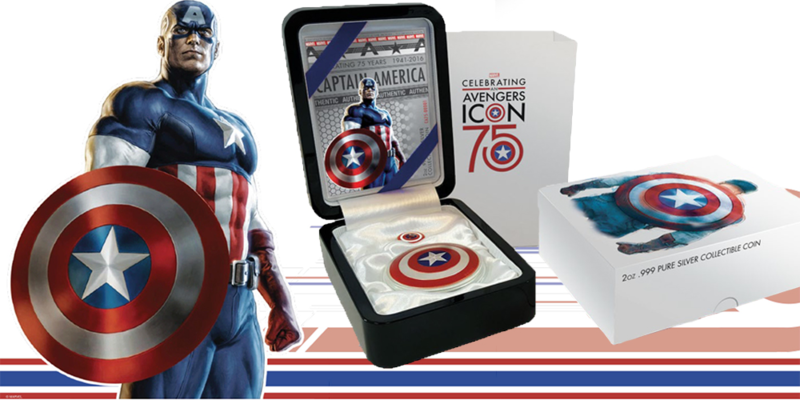 ★ Slipcover storage box embossed with MARVEL’s official Captain America 75th Anniversary theme.